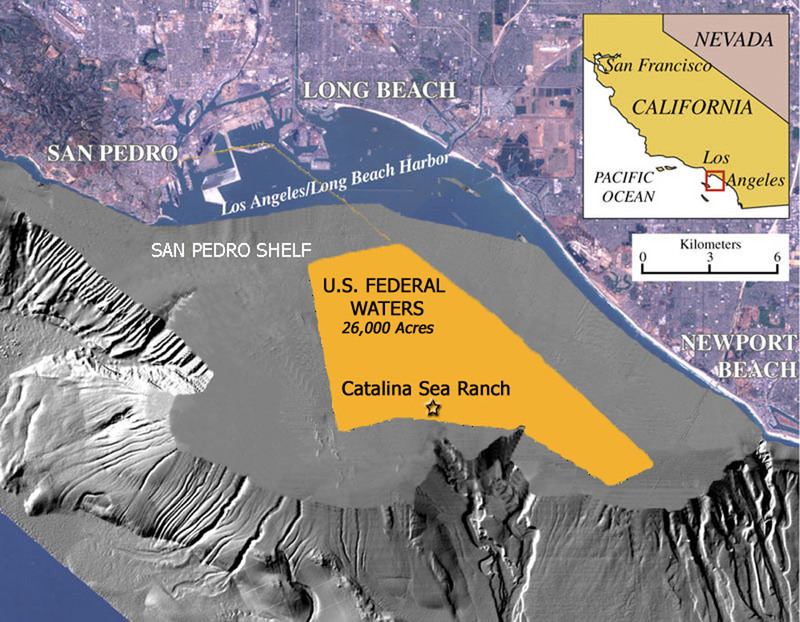 Catalina Sea Ranch's 100-acre aquaculture facility is located on the periphery of about 26,000 acres (40 square miles) of U.S. Federal waters of the San Pedro Shelf, which is one of the broadest mainland continental shelf segments offshore California. The legs of three offshore oil platforms located about two miles away are teeming with marine life and blanketed with mussels and scallops thriving on their consumption of single-celled phytoplankton. Being located 6 miles offshore eliminates any visual blight from operations and minimizes potential conflict with recreational sports such as sailing, jet skiing, and surfing. The further offshore the better for minimizing marine crop exposure to inland stormwater runoff contaminated with bacteria and other pollutants. Moreover, the ocean flushing characteristics in offshore waters provide a cleaner environment for preventing disease that are a prevalent problem with inshore aquaculture. Most importantly, the enormous upwelling phenomenon from adjacent 3,000-foot depths produces phytoplankton flowing onto the shallow San Pedro Shelf serving as rich feed for rapid growth of numerous sustainable marine crops. The shallow 150-foot depth of this massive underwater plateau is optimal for deployment and maintenance of aquaculture cultivation gear. The San Pedro Shelf is an exemplary location for developing a sustainable aquaculture industry to help meet growing consumer demand, reduce U.S. dependence on imports, create jobs in coastal communities, and maintain working waterfronts. Its proximity to San Pedro and a sea-savvy skilled workforce and seafood industry infrastructure is ideal for economical processing and distribution logistics.